On Friday night, May 4, 2007, I had the honor of working with First Friday Doylestown to help pay tribute to two young men from our town who died while fighting for our freedom in Iraq. 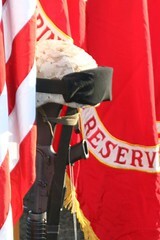 Marine Lt. Travis Manion and Army Ranger Colby Umbrell were remebered at a town vigil. Hundreds of residents came out to pay their respects to the two families who have lost their sons. The Intelligencer covered the story at http://www.phillyburbs.com/pb-dyn/news/113-05062007-1342060.html. My heart goes out to the families. My husband said it best, "I never want to walk a day in their shoes but if we do, I pray that we can be as graceful and dignified as the Manion and Umbrell families." I couldn't agree more. God bless them and God bless America! To see all the photos from the evening's tribute, click here.